Port Byron High School "Red Devils"
The History of the Port Byron High School "Red Devils"
Port Byron, Illinois (population 1,535) is located on the panhandle of Rock Island County in Northwestern Illinois along the mighty Mississippi River and on the Great River Road, Illinois Route 84. The village was founded in 1836 and once had a junior college near the turn of the century that had dormatories. PortByron was founded in 1833 and originally called Canaan. The name was changed to Port Byron, being named after the English poet George Gordon, Lord Byron, in 1837. The above pictured building is the aforementioned academy. The portion to the far right is the original "Academy." The year the building was erected is not available at this time. 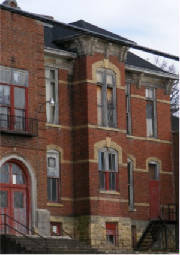 The dormitory rooms were located in the original, middle section of the building. The gymnasium, located to your right of the main building above, was added onto the original school many years ofter its' initial construction. 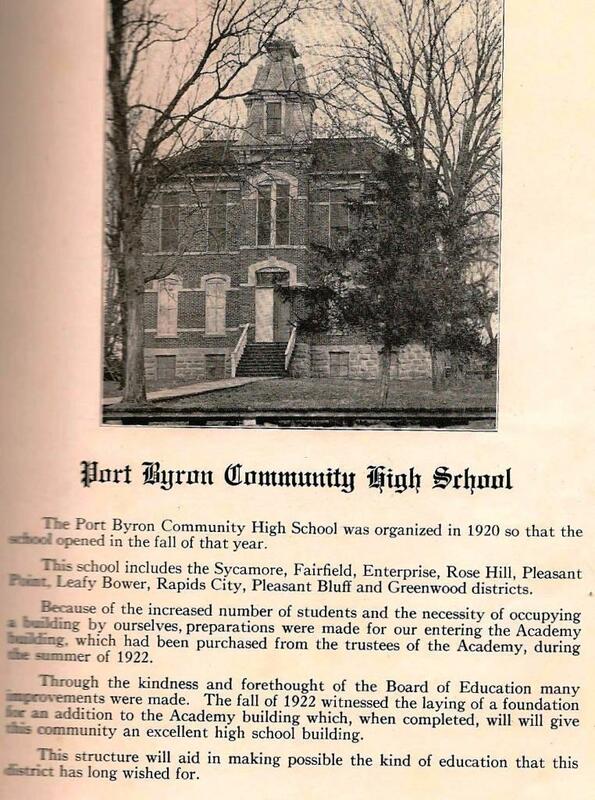 Below is a history and photo of the Port Byron High School Building as shown in the 1923 yearbook titled "The Harper." The photo below and others from this yearbook shown on this page were sent to us by Kathy Korht. 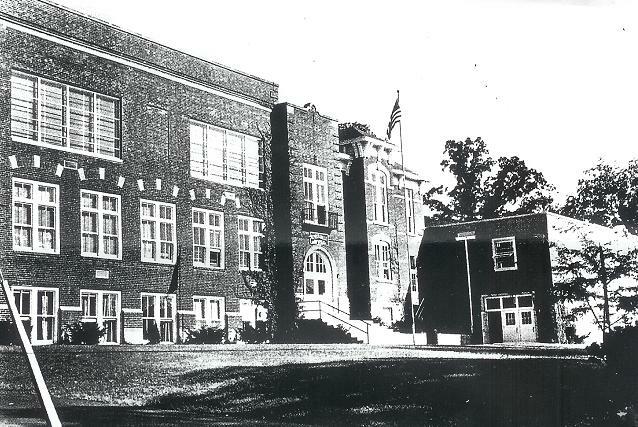 Port Byron High School consolidated with Cordova and Hillsdale High Schools in 1956 to form Riverdale High School. 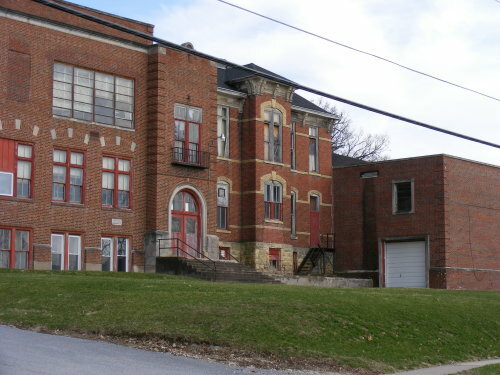 The above pictured Port Byron High School building served as the Riverdale High School building until 1967, when a new building was constructed between the towns of Port Byron and Hillsdale. The web address for the Riverdale School District is http://www.riroe.k12.il.us/riroe/riverdale/ . The Port Byron High School Building was used as a business called Commercial Towel Service (CTS) for many years. It was abandoned in the early 2000s. Though the building was recently determined to be structually sound and prime property for lofts overlooking the Mississippi River, it was never used again. Bill Alper tells us the building was razed in August of 2015. 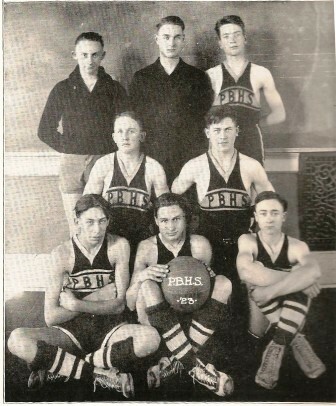 Port Byron offered a variety of athletics in their existance. 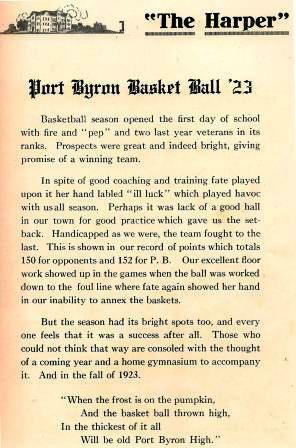 It is known that Port Byron competed in the old Two Rivers Conference during the 1940s and 1950s. Member schools included *Cordova, *Hillsdale, Erie, Prophetstown, *Lyndon, *Atkinson, Annawan, *Tampico, and *Mineral (* denotes school on this site). Port Byron's Red Devils won three District Championships in Boys Basketball, coming in back-to-back-to-back seasons in the middle 1950s. Information is needed on other teams and records of Port Byron High School. Some scores involving Port Byron High School in the annual IHSA State Tournament were located on a website titled "Illinois Postseason Basketball Scores." The scores found are listed below as well. 1922-23 3 - 6 Postseason scores & coach's name needed. 1923-24 through 1932-33 Postseason scores, records, and coach's names needed. 1937-38 Postseason scores, records, and coach's names needed. 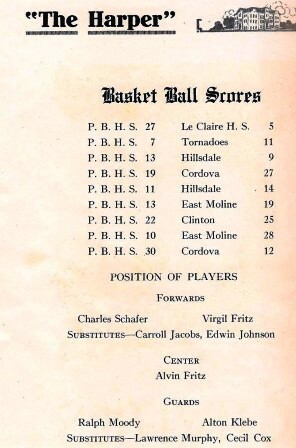 1938-39 Postseason scores, records, and coach's names needed. 1939-40 Postseason scores, records, and coach's names needed. 1941-42 Postseason scores, records, and coach's names needed. Coal Valley lost to Lyndon in semi-final. Alwood beat Coal Valley for title. *1955-56 Postseason scores, record, and coach's name needed. *Final year for Port Byron High School. Became part of the Riverdale School District in the 1956-57 school year. The Port Byron Red Devils also competed in football in the Two Rivers Conference. Behind the school pictured above lies land known as the Dorrance Park Forest Preserve. The land adjacent to the back of the school building served as the Port Byron football field and was host to many "Friday Night Lights" grid iron contests. Today the old field has given way to baseball diamonds for the town of Port Byron. 1955 was the last season Port Byron independently fielded a football team. Last win was 54-12 over Hanover. More information is being sought about Port Byron High School; use the Guest Commentary Form or the School Submission Form to submit. If you have more Information about Port Byron High School, including the nickname, school colors, the school song and especially win-loss records and other great teams you would like to share please e-mail this website at ihsgdwebsite@comcast.net. .